As you progress up the courses, the amount of running on paths decreases steadily, so while a white or yellow course is only along paths, a good green, blue or brown course may not follow paths at all. To prepare you to start moving away from paths and tracks, you need to start looking at other line features. Line features are those that follow an unbroken line, as opposed to point features, like rocks and knolls, and contour features, in the ground itself. They include paths, rides, walls, fences and earth banks. Try planning your route for this short course below, remembering to use line features other than paths. The route drawn below shows how line features can lead you into the control. On the 2nd leg, you come off the path, knowing that you will hit the earth wall, and if you turn left you will reach the ruin where the control is. Likewise, on the 3rd leg, following the ruined wall will bring you to the control. White and Yellow course will always follow paths. Orange courses start to leave the paths and cross open forest, but there is always a line feature most of the way, like leg 3 above. 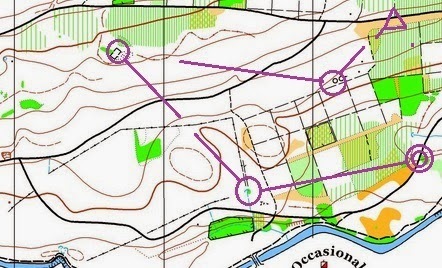 Leg 2 might be found on a light green course, where you have to run across open forest before reaching the next line feature.